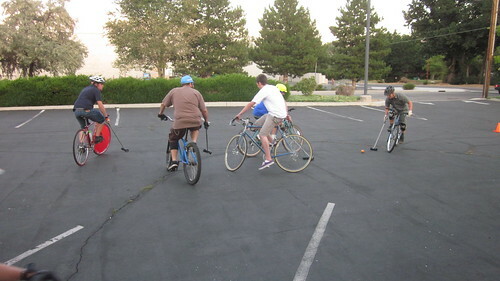 It’s time for Bike Polo! We had a blast playing last year, and by the end of the season, some riders had even acquired what could pass in some circles as “skill”. This Thursday, May 3rd, the ball will be rolling again. Each team has 3 players. Mallets MUST be held in the right hand. A player may hit the ball in two ways: a “shot” or a “shuffle”. A shot is made with either end of the mallet head whereas a shuffle is made with the side. In order to score a goal, a player must hit the ball into the opposing team’s goal with a shot; if the player uses a shuffle, the goal does not count and play continues. Because of the right-handed rule, some players have moved rear brake levers to the left side of the handlebars. You may not touch your feet to the ground during play (known as a “dab”). If you dab…and you will…you must stop playing, ride to the side center cone and “tap out” before resuming play. You may, however, use your mallet to touch the ground for balance. Contact is allowed, but only same-on-same. Mallet to Mallet. Body to Body. Bike on Bike. Mallet to Head or Body to Spokes is not permitted. There’s nothing more satisfying that stripping another player of their mallet when they think they have the perfect shot. You may ride any bike. Everyone seems to have their own preference, and each style of bike seems to lend itself to a certain advantage and weakness; for example, a bike with a high seat gives you full leg extension and makes it easier to zip around the court. The disadvantage is you have a higher center of gravity which may make you less maneuverable or more prone to endos. Crashes and damage are not uncommon, so leave your Ibis or Trek Madone at home where it’s safe. 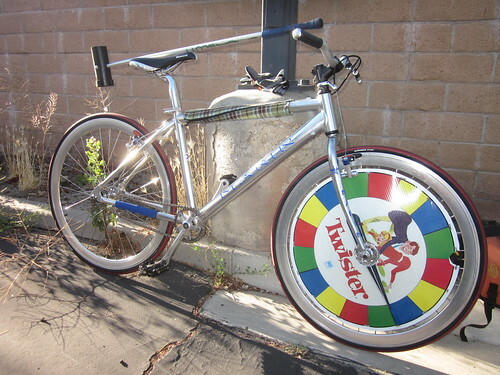 Instead, resurrect that beater bike from the dark corner of the tool shed. Last year the primary injury was to the shins and knees. You may consider armor. Secondary injuries were bruised egos. These wounds may last forever. Sound interesting? Come on down this Thursday night to play or just watch. We rotate teams after each game, match up teams by ability, and everyone gets to play: guys, girls, and kids. We have extra mallets. All you need is you, your bike, a good attitude, and some protective gear. Disclaimer: Although we just play for fun, it’s not unlikely for a spill or contact. Play at your own risk, to both your body and bike. Helmet, gloves, knee and shin guards are recommended.